We were treated to an office lunch yesterday to celebrate a few recent achievements. Everyone in our office likes Thai therefore it was decided we would go to Thai Naan on Victoria Ave in Chatswood. Ten minutes after we were seated there was still no sign of menus so we had to go up and get them ourselves which wasn’t the best start. We then had to call them over to ask about gluten free options which also took awhile. 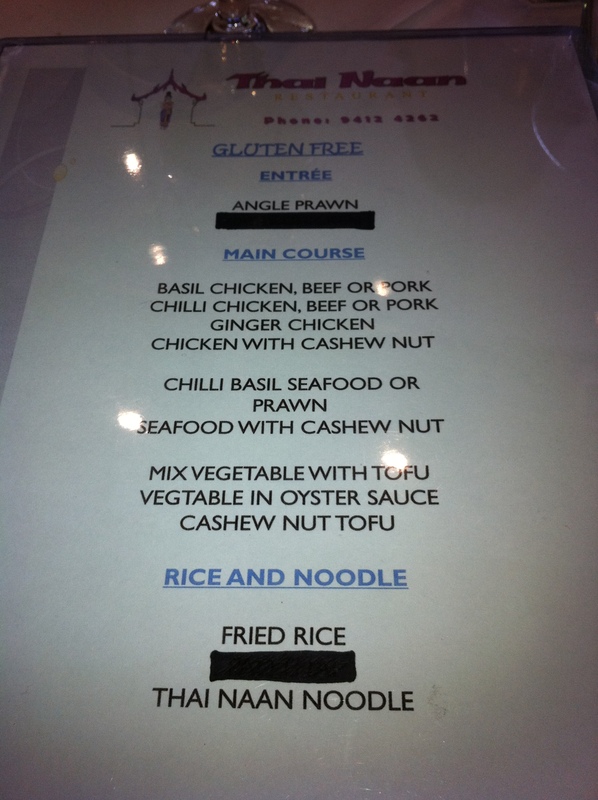 It is very rare to be provided with a separate gluten free menu (I have only experienced this at Movida in Melbourne) however this Thai place had one. There was only one gluten free entree, angel prawns (or angle prawn as the menu stated) so we started with that. We also ordered some fish cakes and duck pancakes for the non-coeliacs at the table. The angel prawns were BBQ prawns served with fresh lemon juice, garlic, chilli and salad. They were tasty however a very small entree when you only have one each. The consensus from the others was that the fish cakes and duck pancakes were very tasty. For mains we ordered a chilli basil prawn, chicken with cashew nut, Thai Naan noodle (all gluten free) and panang beef (not gluten free). The Thain Naan noodle (stir fried prawns, squid, beef and chicken with fresh flat rice noodle, basil and spicy sauce) and chilli basil prawn dishes were my favourites. Unfortunately by the time I got to try some Thai Naan noodle all the prawns and squid were gone however it is great to go out and be able to eat noodles usually only being able to eat rice based dishes. The cashew nut chicken wasn’t bad however this is generally not my first choice as I don’t find it as interesting as other dishes and like a bit of spice when I am having Thai. Unfortunately I did not get any photos as the food was gobbled up very quickly. The customer service wasn’t so great, however if you want some tasty Thai in Chatswood, and don’t mind waiting awhile to be served, I would recommend this place. However if you are up the other end of Chatswood (near the train station) Wi Marn is also a good, tasty Thai place to go to which also labels their gluten free items on the menu. What is your favourite Thai dish? I was suprised at the amount of food avaliable here, and even more shocked at how delicious it was.